Phillip Menditto, Broward county defense lawyer reviews and thanks from his clients. We greatly appreciate the opportunity to represent you and we Thank YOU so much for your testimonials and reviews. You can post reviews on Avvo, Manta and other listings too - ​Thank you so much. Mr. Menditto, I just wanted to thank you for your outstanding services in regards to my license suspension. I was extremely impressed and satisfied when you were able to get me a temporary license and then to revoke my suspension. Your staff was very helpful and always able to explain the various things that I did not understand about my case. I would highly recommend you to anyone seeking help in these issues, and would surely call you again if it happened to me in the future. 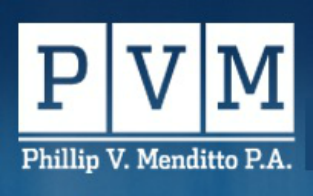 I would like to recommend Phillip Menditto to anyone who needs the service of an excellent lawyer. Two years ago, my daughter got herself into a bit of trouble and my first thought was to call Phillip, as he has been a close family friend for many years. His prompt and professional manner put me at ease right away in my time of distress. His extensive knowledge of the law enabled him to achieve results that were acceptable for all involved, and in a timely manner. He is extremely competent and trustworthy. I am confident that Phillip Menditto has the ability to provide the necessary means pertaining to your own personal needs. Thank you, Phillip for all you have done. I had a great experience working with Phillip Menditto. He agreed to represent me even though the likelihood of achieving my desired outcome was slim. He was persistent and understanding, and eventually he was able to reach some success when it came to my case. I am so appreciative that he took my situation seriously, and that he took me on as a client when other attorneys couldn't be bothered. Dear Phil, I just want to thank you again on doing such an excellent job for me on my criminal case. Without your hard-work and due-diligence I would be in prison right now, but thanks to you I was able to leave that courtroom a FREE MAN with all my rights, and freedom still in tact! I'm truly honored and blessed beyond measure to have been represented by such a hard-working, well respected criminal defense attorney such as yourself. Not only are you great at what you do, but you're also affordable and personable. You invest into your clients, and treat each case as if it were your very own. I will definitely recommend you to all my close friends and family. Thank you for being you. Phillip Menditto is one of the best attorneys in South Florida, and I had the privilege of having him represent me. Phil used his extensive knowledge of the court system to strategically deal with my case, and he was able to get me better results than I had originally hoped for when I first met him. His fees are reasonable and his service is unmatched. I would highly recommend Phil if you need representation; you'll be pleasantly surprised with the results!! I've already referred someone to him and their equally happy with the outcome of their case. Thanks again for everything, my defense attorney. Just wanted to say THANK YOU SO MUCH for representing me in the three cases I was in this past year and half. I don't know how you did it, but you saved me from a world of messes my life was in this past year. I will never forget what you did for me. You truly prevented a lot of bad outcomes that could've unfolded for me (LIKE A LONG PRISON TERM!). I don't think any other attorney could have produced such good results for all 3 of my cases as you did. AMAZING…You’re one darn good attorney! And thanks for also giving me payment extensions time and time again. You saved my name, my relationship, and my future… I could never thank you enough. Dear Phillip, I can't thank you enough for the amazing legal service you provided me! Two years ago I was arrested for DUI. I had used terrible judgment by driving under the influence and was facing horrible consequences. My case scenario was bad. I made a big mistake and needed expert legal advice so, on the recommendation of a friend, I called you.You explained the entire process to me and patiently answered my questions and put my mind at ease. You investigated and researched my situation thoroughly and kept me informed of what was going on with my case through phone calls and texts. When you filed a Motion to Suppress Evidence, to be honest, I thought we had little chance of winning. But to my surprise and disbelief, on the day of trial, the judge agreed with you and the prosecution reduced the charge to reckless driving, closed file, no points, no fine, no school, and no JAIL!! It is such an amazing feeling to fight hard for your freedom and win and I owe it all to you! I hope that none of my friends or acquaintances ever gets into any trouble with the law, but if they do, you can rest assured that I will not merely recommend they contact you, but I will dial the phone for them and place it in their hand. First-hand knowledge of the inner workings of the State Attorney's Office, and thousands of cases as a prosecuting attorney for Broward County. He knows all of the judges and prosecutors that will be on your case and has excellent relationships with them. He knows how the system works. This puts him in a better position to get you a better deal. He worked on the most amount of cases and had the most amount of active cases. Most of the other attorneys that I tried gave me the impression that I was their only client or that this was the first time that they had seen my type of case. You don't want to be the first person that your surgeon performs a procedure on, why would you want your case type to be your attorney's first time? He has his own office. Believe it or not, a lot of attorneys rent out rooms by the hour in fancy offices to host their clients, but guess what, it is all a facade. A trick to make you think that they have more business than they really do and are better than they really are. He was the only attorney that remembered the details of my case after the first time that I told him. I can't emphasize enough how important this is. He has dedicated a lot of time to speaking with me whereas I always felt rushed with others or like I had to pay for their time. Again, no one knows what happened better than you, so being able to communicate with your attorney whenever you need to is priceless. He has excellent (extremely knowledgeable) staff, that stay on top of your case and the sweetest lady that works with you on your payments. They are extremely flexible with payments. After I contracted him, he quickly worked out a deal with the prosecutor to have 3 out of the 4 charges completely dismissed and just court fees for the 4th. Simply Amazing! A definite 10 out of 10. If your case is in Broward County, there is no one that will cut you a better deal with the prosecutors than Attorney Phillip Menditto, the best in Broward. Youtube video channel - Broward Defense Attorney Phillip Menditto explains various arrest and court information. Phillip Menditto is one of the top Broward County Fort Lauderdale dui lawyers - map for Broward Defense attorney.